Aurena Laboratories has developed Spray Rinse as a saline-based wound cleansing and irrigation spray to remove foreign bodies and reduces the number of pathogens in a wound. Formulating a wound cleansing and irrigation spray in sterile saline solution achieves a similar osmotic concentration as the human body. The isotonic character of this spray solution ensures that pain or discomfort is not induced when administered to the wound. Aurena Laboratories is a pharmaceutical contract manufacturer of Spray Rinse as a wound cleansing/irrigation spray product range that removes foreign bodies and reduces the number of pathogens in the wound. The wound cleansing/irrigation spray removes blood, clot and dead tissue, moistening the wound tissue in the process. All this helps to reduce infection in the wound, which is one of the most frequent complications of wound healing. Despite the use of antibiotics and modern sterile techniques, infection accounts for considerable patient morbidity, discomfort and prolonged hospitalization. Spray Rinse is a safe and effective product based on advanced formulation with bag-on-valve (BoV) aerosol delivery that dispenses pure solution without being mixed with the propellant, which is kept separate in a bag. The BoV technology allows quick and continuous dispensing, with canister held in any position, to facilitate instant and effective wound first aid. Since the propellant, compressed nitrogen, is not flammable, the spray is classed as a non-flammable aerosol, which offers advantages regarding safety, transportation and storage. Shelf life is three years from production date. Spray Rinse is ready for private label and store brands. 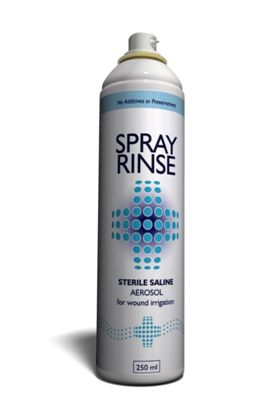 In addition, Spray Rinse delivers a series of user and convenience benefits in that the spray works at any angle, is environmentally friendly, hypoallergenic and can be used with full sterility until the last drop. Aurena Spray Rinse is intended for use in cleansing wounds, cuts, scrapes and burns to support wound healing. It has been developed specifically for the private label market, suitable for a variety of market segments within wound and skin care and first aid, including healthcare institutions, community care, occupational safety and over-the-counter (OTC) channels. Spray Rinse is product approved and registered according to Medical Device Directive (MDD) 93/42/EEC, Class IIa and is manufactured at Aurena’s facilities in Karlstad, Sweden. As a fully developed, market-oriented, well-documented product supported with regulatory expertise, certificates and scientific evidence, Spray Rinse offers very short time-to-market. It is available in 50, 100, 125, 200, 250 and 300 ml. cans with individual carton boxes, with or without leaflets, available for can sizes up to 125 ml. Both sticker labels and preprinted cans can be used. Labels can be provided with a tamper seal. Preprinted cans are recommended for quantities of 25,000+ per order. Click on Aurena Spray Rinse for more information.